Garden fence panels and posts can be an expensive investment so it makes sense to protect them with a garden fence treatment. New or old, using the right treatment can significantly prolong the life of wooden panels and prevent the cost of having to replace them sooner than expected. Fence treatments can also be used to re-colour panels that have turned grey or silver over time as a result of water and UV damage from the sun. 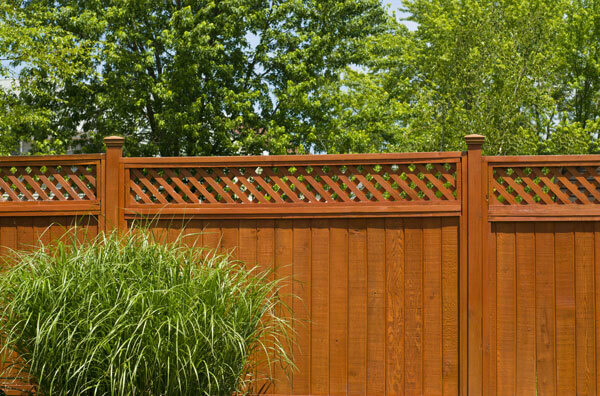 What is a garden fence treatment? A garden fence treatment can be many things. As with garden sheds, decking and other garden wood a fence treatment can be any of the following wood care products. For the best results, a combination of the above products may be required and especially so for older fence panels. Although there are wood preservers specifically marketed for sheds and fences, most exterior wood preservatives do the same job and are perfect for use on wooden fence panels and posts. The job of an exterior wood preserver is to protect garden fences from biological threats such as mould, algae, fungi and insect attack. Exterior wood preservers have traditionally been solvent based. But with new, stricter rules and regulations coming in to force, regarding the use of high V.O.C’s (Volatile Organic Compounds), many new formulations are or will soon be water based. Garden wood preservers are available in both clear and coloured formulations making it easy to keep fence panels looking natural, or staining to an attractive wood tone shade. Find out more about garden fence preservatives here. Wood oils sold specifically for fence panels and posts are virtually non-existent. This is a bit of an oddity as fence panels and posts require as much protection from wind, rain, sun and temperature extremes as any other garden wood. wood oils are excellent at keeping exterior wood, nourished, supple and weather resistant, as demonstrated by the abundance of wood oils and oil based products for garden sheds, wooden decking and garden furniture. For this reason, we recommend treating wooden fence panels and posts with an exterior wood oil or decking oil as part of a regular maintenance program, to keep garden fences looking great and lasting longer. As with exterior wood preservatives, decking oils are available in both clear and coloured formulations so keeping fence panels looking natural or adding a splash of colour is easy. Find out more about garden fence oils here. Garden fence paint products are again a bit of an oddity as many products that are labeled as a ‘paint’ are in fact more like a wood stain that gives an opaque, coloured ‘paint like’ finish to wooden fence panels and posts. Fence paints are ideal for rough sawn timber but can also be used on smoother exterior wood such as garden furniture and benches. They penetrate into the grain of the timber to provide both colour and protection. In recent years, painting garden sheds, fence panels and furniture has become more trendy with many of the main garden wood care specialists such as Cuprinol, Ronseal, Barrettine and Osmo, all offering a range of opaque, coloured exterior wood treatment products. Find out more about garden fence paints here. Untreated fence panels or those that have not been treated for a number of years can be prone to mould, algae and fungi growth. As well as spoiling the appearance of wooden fences, it can also accelerate the onset of wood rot and decay. Treating areas affected by mould, mildew and other boilogical growth with a suitable fungicidal wash is the best way to treat and kill the spores that cause the green and black stains and growth on fence panels and posts. Find out more about garden fence cleaners here. A garden fence stain is perhaps the most confusing product to describe being that any product that colours the wood, be it an oil, preservative, paint or stain can all fall under this category. Although there are many dedicated exterior wood stains available from brands such as Sikkens and Sadoline, these tend to be designed more for smooth planed timber such as joinery including door and window frames. Find out more about garden fence stains here. In addition to tips and advice on garden fence treatments, care and maintenance, we also cover wooden decking, garden sheds and garden furniture.